How come when I was a little girl, I loved the white crap? I loved getting all bundled up in snow pants, snow boots, bulky snow jacket, gloves, a scarf and going out for hours in the freezing cold to play in the snow? Now, just get me to Isla where I can lay in the sun under a palm tree and feel the sun baking me from the inside out!! Last night Biggy B and I sat in the hot tub on the patio as the white crap began to fall from the sky. We knew that we were under a winter storm warning, but those weather people get paid for a 50/50 prediction, so we figured it would be just another day when we woke up!! Well, here is what we woke up to!! Lots of white crap!! Schools closed for the day. This is looking out our bedroom sliding glass doors. You can just see the top of the hot tub that we walked out to less than 12 hours ago. 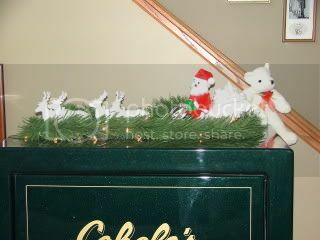 So...being in the spirit of Christmas and getting my decorating done, I will share some of our decorations with you. Some look pretty cool with the white crap in the back ground. 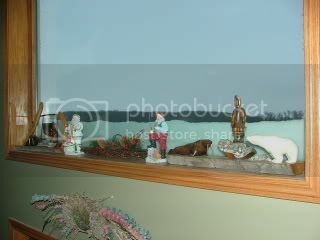 The first big picture window with the Santa Theme. See the natural white crap in the background. I didn't even have to spray it there. 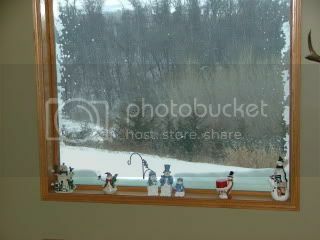 The second big picture window is the snowman theme. More white crap in the background. It's actually rather pretty with the woods in the background!! And the safe, which is in the living room because we couldn't fit it through any other doors. 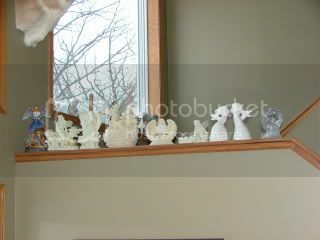 Above the safe, overlooking the living room, on the railing, I have arranged an Angel Theme. 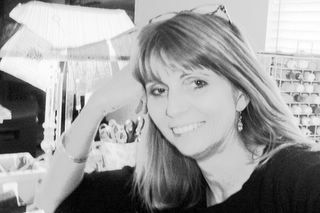 I started collecting Angels, in memory of our daughter, Savannah. By the living room French Doors sits a bench that was hand made by our friend Mike. 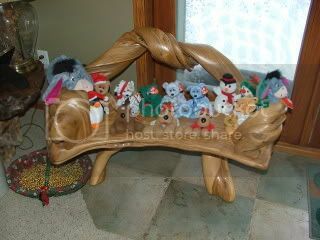 I have arranged all of the Christmas Theme Beanie Babies. 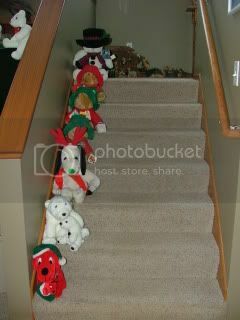 Going up the stairs to the loft, I put all the Christmas Theme Stuffed Animals. Some I have saved from my younger days. 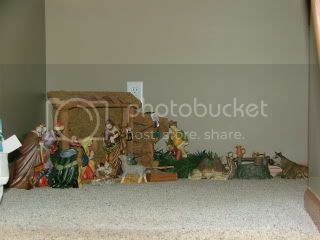 And then on the halfway landing sits The Manger Scene. I have added lights around it that make it glow at night. 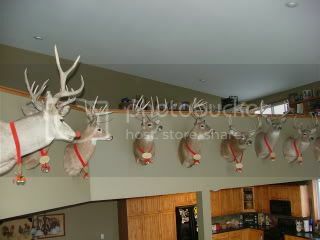 And then there are all the reindeer that Biggy B shot and stuffed!! Sorry kids, Santa's Sleigh won't be landing on your roofs this year because Biggy B, the great hunter, hunted them down!! Notice the one closest has a red nose added. He is Rudolph. Each one has a tag with their name and bells. Rudolph, Dasher, Dancer, Prancer, Vixon, Comet, Cupid, Donner, Blitzen. 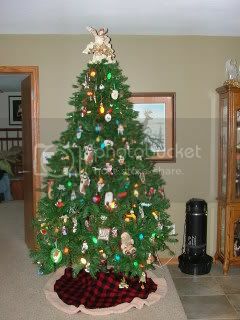 Last, but not least....The Christmas Tree. Anyone notice the deer jumping out from behind the tree? Thanks for letting me share our Christmas Decorations with you all. Now we have to start clearing that white crap!! Yikes! That is a lot of white crap. We were huddled in bathroom under the stairs at midnight last night beacause the tornado sirens were going off! Weird for December. Snow is fine as long as I can stay inside by the fire and sip coffee. Pretty decorations, the reindeer are a hoot. I am so sorry that you have that white *$#*&!!! I hate it! Your decorations are quite festive! Anyhoo, hope you are seeing white SAND soon, instead of you-know-what! I feel inspired now to do some kind of decorating! We've been remodeling and we're almost done and Perry goes to Cozumel! Well, most of it's done. You got alot of white crap! We were lucky enough to get rain, that froze last night and white crap on top of it. Makes for a lovely drive to the airport at 4 am! Your decorations are great! and the deer are hilarious! 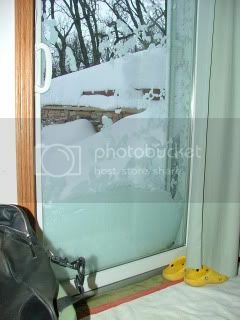 I always loved white crap on sliding glass doors. Thanks for the memories! Thanks Brenda for sharing your great decorations! Now I can see why it took you three days, LOL. White crap on the weekend here, rain and freezing rain last night and today, snowing again now....and it is not even mid December. You are sooooo lucky to be headed to Isla soon amiga! Thanks all for your kind words on the decorations. 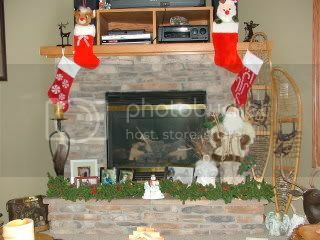 I really do love decorating for Christmas. I have others too, but these were the highlights. Just finished most of the Christmas Cards, but have to get a few more made tomorrow. Now it's on to wrapping!! OK, you've done it now, I'm going to have to hang my chili pepper lights. That and my pinata are as far as I go anymore, after giving up all my decorations in the move to Mexico. But we all have to make sacrifices, right? Do you think you could bring me down a couple of very small items from the grocery store? If so, shoot me an email. Thanks.